Publix Weekly Ad Apr 17 – 23 is available right now. Check out this ad to see the latest news, deals and product range. Read reviews for details and top deals. Publix Ad Latest Coupons and In-Ad Deals, Bogos, Discounts and other deals related to the Publix stores are all available. In the latest and you may certainly find something for you and total savings can be seen on the cover. Publix is one of the rare grocery stores defining healthy products and setting the trends for it. You’ll end up with the greatest amounts of savings. They serve in Florida, Georgia, Alabama, North Carolina, South Carolina, Tennessee. Learn How To Do Coupon Matchups and save even more with ads. Find great dinner ideas, Mother’s day gifts, Christmas gifts, Thanksgiving meal ideas, and many more goods in Publix Ads. Subscribe with your e-mail to get future weekly ads of this retailer. Leave comments for the posts and reviews below. You can also send us an e-mail as well. 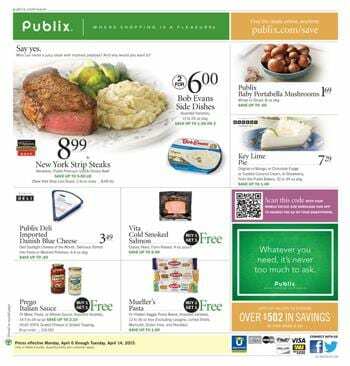 Publix Weekly Ad Preview May 27 2015 meals, supermarket food, packed products and fresh products can be viewed from today. The sale starts on May 27 until June 2 2015. Publix has got new products for everyone and taste. Simple meals and Bogo free deals are among the most popular products of Publix in general. Publix Ad regular products are featured in the entire list. Save with Publix Weekly Ad items with using the preview of this product range. In the official page of the ad you can see coupons as well. Don't miss out these savings. Nabisco Wheat thins or triscuit crackers BOGO deal ! Publix Ad Weekly Offers household products are featured on pg; 2. Prices of laundry detergents, top quality cleaning supplies and some products from packed food items are also available on pg; 2. Propel unflavored electrolyte water BOGO DEAL! Check out these deals on pg; 6. Tomatoes, asparagus, sweet corn and potato inspirations are on sale at the prices exhibited on pg; 6. 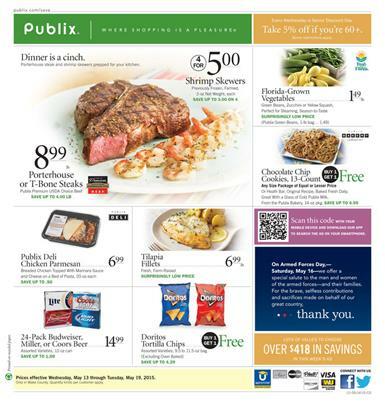 Publix Weekly Ad Preview May 27 2015 Meals are available on cover page. Check out the first page for these product as well as these. 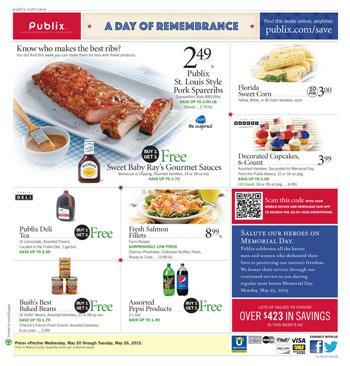 Publix Weekly Ad Preview 5/20/2015 of products of finest selection of meat, celebration food, memorial day sale are readable on the preview page. CLICK HERE TO SEE NEW PUBLIX FRESH FARE ! You can click on the image of the cover page of the full preview to see them. View all of the products to get a nice price range for the best meal range among all supermarkets. Also don't miss out other ads. Albertsons, Publix, Ralphs also published their new ad on Wednesday. Delightful advice by Publix Ad is what you can get from this preview. To see an amazing sale of Publix please go to the preview. Find out the best meat sale as well. Publix offers a great product range for the best prices. Bush's baked beans BUY 1 GET 1 FREE. Read a new recipe of Publix Ad on pg; 2. To cook kickin' peach chicken you can use this recipe. Also check out the new beverage sale of Publix on the same page. Floral products, some of the drinks, and Memorial day bouqet on pg; 3. Meat meals such as NY strip steak, and seafood meals on pg; 4-5. Fresh food including fruits, peach, grapes, avocados on pg; 6. Vegetable variety and Tasti-Lee tomatoes on pg; 7. Great bakery products, potato rolls, some snacks on pg; 8-9. Sauces, Kellogg's cereals, dairy products on pg; 10-11. On pg; 10-11 you can get BOGO deals. A lot of BUY 1 GET 1 FREE deals are featured on these pages. Many more products including pet food and household supplies are available in the latest Publix Ad. Don't miss out any of them. 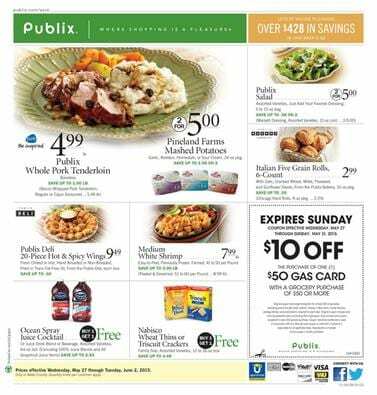 Publix Weekly ad 13 May 2015 delicious meals are appetizing, healthy, and perfectly priced for customers. Take a look at this new Publix Ad to save and get the best products. Coupons, Buy 1 get 1 free deals, and Publix products are featured. 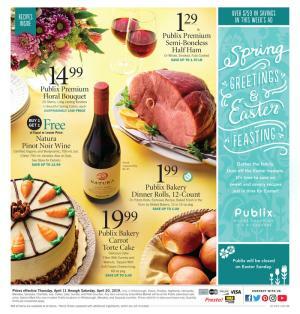 Publix Weekly ad 13 May 2015 contains only food, household needs and general weekly shopping items but on the official page of Publix we can see other deals like outdoor patio furniture, pet food, extra savings and other coupons. At Publix Stores Wednesday is the discount day which means you can take 5% off if you are over 60. On the cover page there is code which can be scanned by your smartphone to download the app of Publix Ad. Check out recipe of Three Pepper Fish. It's a 30 minute recipe for 4 servings. All ingredients are available at Publix Stores. On pg; 2 you can reach this recipe. Publix Weekly Ad 13 May 2015 offers many more than these. Steaks and finest cut of meat are featured on pg; 4. Take a look at the new Publix prices for steaks, seafood products, side dishes, drumsticks. Extra Large white shrimp $9.99 lb pg; 4. Seasonal fruits are popping up this month. Watermelon with its excellent refreshing taste is among us. Also corn, tomatoes, broccoli, onions are available as seasonal fresh food of Publix Ad. Fresh&Fun salads, BUY 1 GET 1 FREE. Vidalia Sweet Onions $1.29 lb. Publix Mothers Day Meals and drinks are the main focus here. 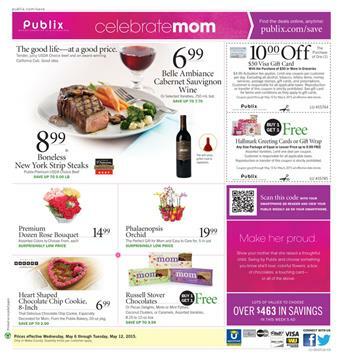 An excellent celebration range of meals, drinks and specials by Publix Mothers Day Weekly Ad is prepared for this week. You can browse an elegant selection of top quality meals on this part of the shopping. Publix Ad savings start from the very beginning of the whole sale. Check out cover page exhibiting boneless NY strip steaks, and some of the flowers which are always considered to be great gifts for especially beloved and respected mothers of ours. Besides the meals drink selection being exhibited on the weekly ad deserves a look. For her special day give her a good treat from Publix without paying a fortune. At reasonable rates you can purchase a good special for her and the family. Meals are on pg; 4 with lobster tails, whole chicken, seafood and their amazing values. Publix GreenWise Whole Fryer Chicken $2.49 lb. And many more of this delicious understanding meals are available. Fresh food, salad kit, vegetable started to be exhibited on pg; 6 is another excellent option from Publix. You may have a look at tomatoes, potatoes, spinach, onions and more fresh food on that section. Please visit pg; 6 for details and images of the products. I think it's a good idea to bring her some fresh fruit and a good choice of bouquet like the on pg; 7. A logical decide because of the reasonable price and very good looking collection on the bouquet. The price is only $12.99 for that one. Very high quality food products and meals are perfectly advertised on new Publix Weekly Ad 6th April 2015. You can see full sale of Publix Weekly Ad here. It is an excellent shopping item to save getting top quality. Deli products and delightful options of meals are featured on cover page. Mushrooms, pie, salmon fish, cheese variety and steak varieties are mainly featured products. The price you are going to have to pay for New York Strip Steaks is only $8.99 for lb. You will be $5 per lb. Check out some of the products on cover. Prego Italian Sauce buy 1 get 1 free $2.19 ! Snacks and confectionery savings can be found on pg; 2. You can sign up for future coupons of Publix on official page. See meat meals of Publix on pg; 4. Great offers are available in this week. Seafood is also included by Publix Ad. Don't miss out these savings. Check out these fresh food items on latest ad. You may find out tomatoes, potatoes, vegetables, cheese and similar sort of products on pg; 6.